Members of the 15th Kashag at the prayer service for late self-immolator Passang Dhondup. Dharamshala: The President of Central Tibetan Administration, Dr Lobsang Sangay today discouraged self immolation protests and urged Tibetans to pursue more powerful means by honing one’s educational, professional and personal competency to substantially contribute to the Tibetan cause. “While we understand the intention behind the act of self-immolation, we must remember that the life of every Tibetan is precious and that we must be alive to fight for our cause. In a free country, we have the freedom to embark on all possible methods to contribute substantially to advancing our cause. The life of every six million Tibetan is precious and every life lost is a huge loss for us and for our cause,” said the concerned President. President Dr Lobsang Sangay was speaking to the press at the prayer service for Passang Dhondup, who succumbed to his burns after self-immolating on Saturday, 29 July 2017. Click here to watch. President further said Kashag is considering not to attend prayer meetings in the future for self immolation protests in exile. Speaking to the press today, CTA President said, “As a Tibetan and a Buddhist, we are here to offer prayers for the deceased, but the Kashag has consistently and categorically discouraged self-immolation, especially in exile where Tibetans have the complete freedom to pursue any meaningful means that would contribute to the Tibetan cause. “While we understand the plight of Tibetans inside Tibet and the situation under which they have to resort to such actions, Tibetans in exile have the freedom to participate in protests in any form one chooses to do. We have had other cases of self immolation in exile; parents of the self-immolators have voiced the same concern and have urged the youth to pursue more powerful means such as education. “We therefore discourage all Tibetans, especially the youth in exile from resorting to such drastic actions and urge them to pursue more powerful means to substantially contribute to the Tibetan cause.” the President said. “There are other numerous means to make meaningful contribution to the cause, President Dr Sangay said. “First is education; focus on achieving excellence in your educational field, become a resourceful member of the community and go on to represent Tibet in governments and parliaments around the world. 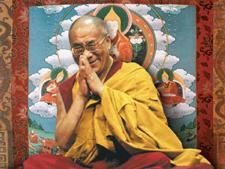 “Second, preserve Tibetan identity, language and culture. Third, be a part of various NGOs and organise activities to garner support and awareness on the Tibetan issue. Even in schools, one can organize awareness events such as panel discussion, art and literary festivals and educate people on Tibet. “One can also write articles on Tibet or even organise a march for Tibet. There are multiple opportunities for us to contribute to the Tibetan movement, without resorting to self-immolation,” the President noted. Passang Dhondup’s body was cremated this morning following the prayer service at Lhagyalri. Representatives of Central Tibetan Administration including members of the Kashag and members of the Tibetan Parliament-in-Exile attended the prayer service as a mark of solidarity with Passang Dhondup’s family and friends. 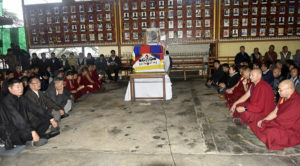 The prayer service and the funeral were organized by Norbulingka Institute. Passang Dhondup, 48, was a wood painter at Norbulingka Institute. Originally from Gyaltse in Shigatse Prefecture of Tibet Autonomous Region, Passang arrived in India in 1991 and had worked from 2012 as a wood painter at Norbulingka institute.